Apprehension towards NS hints at deeper family matters. Have you ever sat on the couch and gone on a TV marathon that lasts for so long that your vision gets blurry, your body goes limp, and it begins to become hard to tell reality from fiction? Toy Factory’s Watching covers precisely that feeling. Written and directed by Toy Factory associate artistic director Stanley Seah, Watching follows teenaged Tony (Keith Lee) as he counts down the days before his National Service enlistment. Filled with dread, he chooses not to distract himself with part time work or learning new skills, but finding an easy escape – plonking himself at home in front of the nice flat-screen TV and wasting his days away. 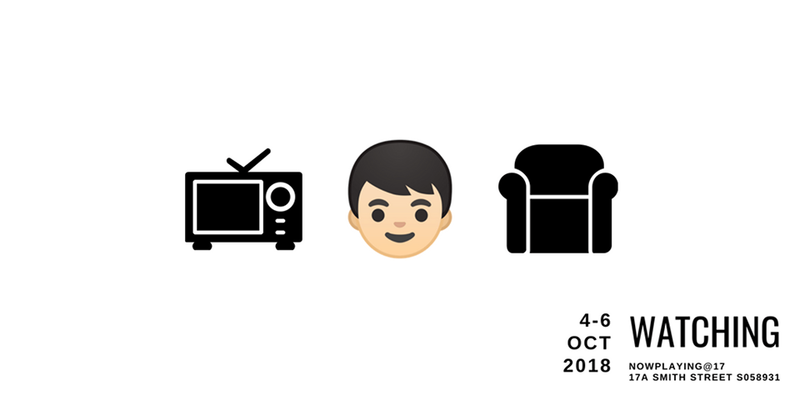 But as the days wear on and his sister Alice (Tan Hui Er) loses interest in responding to his calls for attention, things begin to get weird as the TV (Jon Cancio) comes alive, and begins talking back to him. Taking place in Toy Factory’s NOWPlaying@17, the experimental space naturally gives way to unusual staging, with the audience invited into a ‘living room’, and seated on furnitures such as bookshelves, tables and even piles of newspapers, making for a rather unorthodox viewing experience. As Tony, Keith Lee captures the feeling of slumping over a couch for far too long, tossing and turning whenever maintaining the same position gets uncomfortable. There’s an annoyance to his character in the way he continually calls for Alice, as he becomes a modern boy who cries wolf, each time he lies and tells her there’s something interesting on leaving her increasingly frustrated and disinterested. Alice, on the other hand, seems to be the polar opposite of her 2 years younger brother, as an overachieving scholar in university. Here, Tan Hui Er does a formidable job as an exasperated sister at her wit’s end, yet unable to fully bring herself to hate him, in a believable sibling relationship/rivalry situation. Eventually, she tells Tony not to watch so much of the ‘stupid TV’, provoking an argument between the two, as Tony yells at her to apologise to it, while Alice shoots back that just as he watches the TV, the TV might just be watching right back. Enter Jon Cancio as the TV, as he manifests before Tony’s very eyes, acting as a warped voice of reason as he chides Tony (with increasingly terrible dad jokes), countering his whines (“But who will hire someone for just two months!”) with logic. Before we know it, Tony breaks, and begins to reveal the underlying truth behind it all – the true fear isn’t the act of entering NS, but the fact that once he enters, he fears losingthe clos the person closest to him – Alice. With the time spent in camp, the age gap between them only grows further, as already, the scholarship changes Alice into a shadow of her former ‘cool sister’ self. That feeling is shared to a lesser extent by Alice, who loves her brother so much, the television was in fact, bought by her for him, after noticing him squinting continually at the older, much smaller TV. 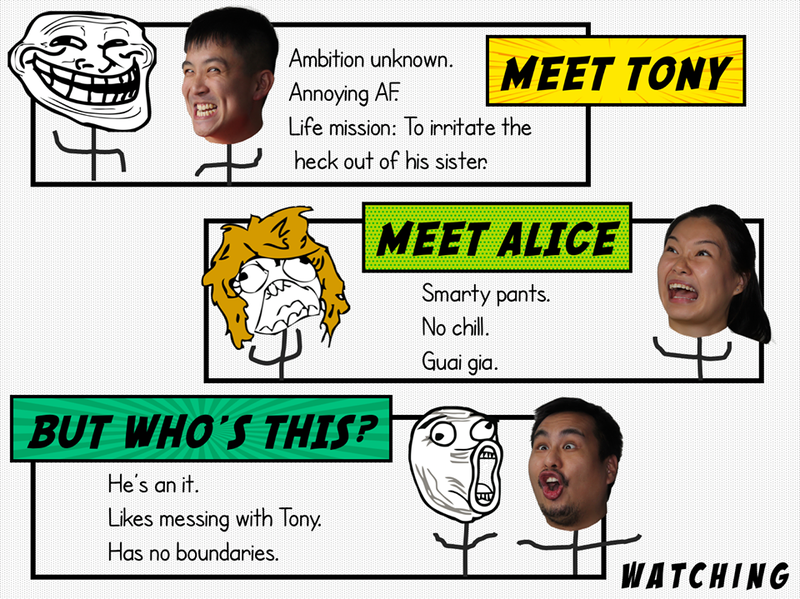 Ending ambiguously, Tony’s fears all come to a head as Alice and he part ways at last on enlistment day, with Alice promising to always be there for him, but the true future left unknown, and it is the siblings’ keen and believable bond (helped by the strong chemistry between Hui Er and Keith) that delivers that necessary, final twinge of pain. While conceptually interesting and equipped with a strong cast that lifts the play as much as they can, Watching still feels like a work in progress, an idea about the perils and paranoia of growing up that has yet to be given enough time to fully develop into the best version of itself it could be, neither pushing far enough with its unusual premise nor in the potential it has with its experimental space. One appreciates the opportunity Toy Factory has given the work to breathe and receive audience feedback, and hopes that should it ever develop further, comes back more assured of its message, bolder in its staging and hitting harder at one’s emotional core.